Make a Change – Have Some Fun! Laugh out loud! Go on, aim for a real belly laugh. Just do it! 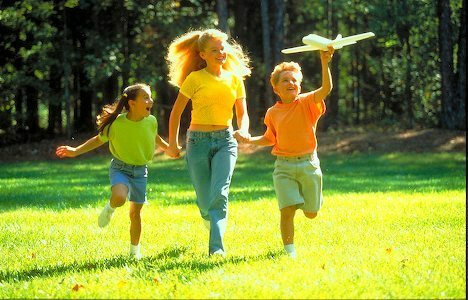 If it doesn’t feel natural think of some positive triggers: funny family photos or memories, a time when you couldn’t stop laughing, music, a comic book or sketch, dancing, singing, or whatever lights you up. Simply by thinking of this you will sense a shift in your mood and posture – your head is held high, your face lights up, and you feel positive. Bring a toy into work, or a picture that makes you smile, and share it with your team. This positivity will radiate to all those around you and open up channels of communication. You will instantly feel stronger, more alive and creative. The benefits of keeping a sense of fun and happiness are simple. Finding joy in every situation results in life’s challenges becoming less daunting. By sharing play and enjoyment with others you will communicate more effectively and your relationships will deepen and strengthen. People will enjoy being around you and tasks will seem less onerous. So go on, dissolve into laughter and approach your life with a positive glow – just watch how it transforms you and all those around you. REMEMBER: Laughter is contagious so share it often and generously. The more people laugh together the stronger their relationship becomes. It’s the most satisfying way of communicating to all involved so don’t be shy – you’ll reap the benefits. TIP: Know what makes you laugh. If you’re feeling cranky or have a difficult task ahead, remember a hilarious moment, really focus on it, allow the smile to radiate and give out a real belly laugh. You’ll find you will approach the task with greater ease and less trepidation. TECHNICAL STUFF: Scientific studies have shown that having fun and laughing reduces stress, boosts your immunity, enhances communication, decreases anxiety, inspires creativity, raises morale and helps us keep perspective and balance. It’s got to be good! CAUTION: Closed lipped smiles – you look like you’re hiding something. Solution: authenticity – keep it real and show those teeth when you grin. FINALLY: Enjoyment holds the capacity for transformation in every realm –business, personal and spiritual. Laugh more, share it with others, feel better, live longer and attract more abundance into your life. COMMENTS: We value your experiences, suggestions and ideas. We would love to hear your recommendations for how to have fun at work and how it helps you get through stressful times. Share your thoughts with our readers by sending them to info@kuhnkecommunication.com . Too often I hear intelligent, genuine and committed business people speak like morons. Their sentences are full of meaningless words that sound important and have little substance. Hype and corporate-speak replace honest and clear language. Who’s impressing whom and what’s the point? The people who spout out words like ‘paradigm shift’, ‘synergistic relationships’ and ‘extensible repository’ know they’re talking bull because this contrived language is the exact opposite of the way they speak outside of the office. Away from work their human voice kicks in, with stories and anecdotes to convey their messages. They are informal, spontaneous, funny and real. Once back at their desks the jargon takes over and these smart, talented and sensitive people sound aloof, arrogant and condescending. Conversation is replaced by hollow, vapid, vanilla-coated communications. And what’s worse? This language is so empty that it gets ignored. The listener disconnects and no one pays attention. The message gets lost, sometimes at great cost. On 1 February, 2003, the seven astronauts on board the space shuttle Columbia were killed when their aircraft disintegrated on re-entry into the earth’s atmosphere. Could this horror have been prevented? You bet it could have. While The Columbia Accident Investigation Board refrained from saying that Power Point caused the Columbia disaster, they did agree with Tufte and acknowledge that the PowerPoint style of writing – compressed and formulaic –concealed the critical message. What might have been a better approach? High-resolution photographs of the actual damage would have made the point quite dramatically. All too often, when the slides go on, the audience nods off. How can you use technology to create a presentation that engages, entertains and enlightens your audience? Be creative in your use of software. Title your presentation as if it were a best- selling thriller. Avoid SGPs (Stupid Generic Photographs). Use original photos and artwork. Or, would you prefer to rely on ubiquitous clip art? You don’t have to parachute into the conference room to create an impact. All you have to do is avoid the predictable. Get your creative juices flowing and break a couple of ‘rules.’ Your audience will love you for it. Some people thrive on chaos. Others prefer a structured environment. While I’m one of the former, I am well aware that organised living, thinking and working provides a structure within which you can perform at your best. Practise these simple steps to feel energised, focused, and – may I say – joyous as you tackle your tasks with new found vigour. Organise your workspace. Be rigorous about ridding yourself of mess and clutter. Keep only what is necessary. If you have business cards collecting dust on your desk while waiting to be put into your data base, either book in time for logging the information, or throw the cards out. By organising your environment you free yourself from fretting about where you put that pen/letter/pair of scissors. Note how liberated you feel when you reach for what you want and it’s there, enabling you to get on with the task at hand. Organise your mind. Allow your mind to go off with the fairies from time to time. Let it wander and free associate. This is valuable creative thinking time. Then, home in on the detail, stay in the here and now, and zero in on the task. Take time at the beginning of each day to review your commitments and ‘to do’ lists. By using a trusted system to remind you of what needs doing, you can commit completely to the job in hand, gaining the satisfaction of ticking the boxes along the way. Organise your work. Anyone who thinks they can ‘wing it’ at work is kidding themselves. A structured approach is vital for success. Set out a plan and take it on one task at a time. ANECDOTE: A client was struggling with his formal presentations. He had no system for organising his thoughts, was unclear about his key points, and hadn’t considered his listeners’ needs and concerns. Working with Kuhnke Communication’s Presentation worksheets, we got him to structure his thinking and his approach. He now embraces the opportunity to present, designing and delivering fail proof presentations on a regular basis. REMEMBER: The biggest challenge to getting organised is getting started – once you start KEEP GOING. TIP: Action those tasks you’ve been meaning to do, or get rid of them. TECHNICAL STUFF: Research shows that interference from distraction negatively impacts on memory function. 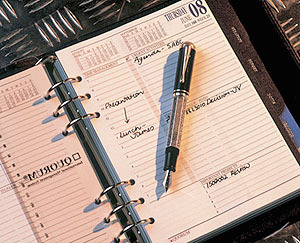 CAUTION: Never-ending ‘to do’ lists can drain both your energy and your time. Categorize them, keep them relevant, and review them regularly. FINALLY: When your working space is free from clutter and your mind is clear and focused you can complete your tasks quickly, confidently and with commitment. From conception to completion organisation is at the heart of success. More often than not presenters want to share everything they know about their subject. That’s like juggling the kitchen sink, the bedroom furniture, and the children’s toys all at the same time. Your listener gets overwhelmed, their interest wanes, and your point gets lost in the detail. So how do you stop this from happening? Connect with your audience. What are their interests, needs, and concerns? Stand in their shoes and see the situation from their point of view. By selecting the relevant information to juggle for your listener, you ensure their attention from the outset. Stick to the Rule of Three. Be selective. Three points, supported by no more than three sub-points each, is plenty for both you and your audience to juggle at one time. Summarise. No matter how interesting, relevant, and engaging your presentation, your audience will forget what you’ve said if you fail to remind them. When you begin, tell them what you are going to tell them. In the middle, tell them. At the end, tell them what you told them. By juggling your presentation this way, your listener will retain your message. REMEMBER: A long string of facts and data is hard to remember. When you chunk information into three sub-divisions it’s much easier to retain. Example: the letter sequence – adgjlmcnb is more easily remembered as adg – jlm – cnb. TIP: Research shows that the brain can easily process pictures and words simultaneously, so juggle some visuals into your presentations. Images add impact. TECHNICAL: Neuroscientists state that the human brain has a finite attention span. After 20 minutes it simply ‘shuts off’. So juggle information into three 20 minute sessions as opposed to giving a 1 hour presentation. CAUTION: Avoid text heavy slides. Studies show that the brain cannot effectively juggle visual and verbal words simultaneously. FINALLY: By applying juggling skills to your presentations you connect with your audience, refine your content, and enhance your delivery. COMMENTS: As always we value your thoughts and experiences. 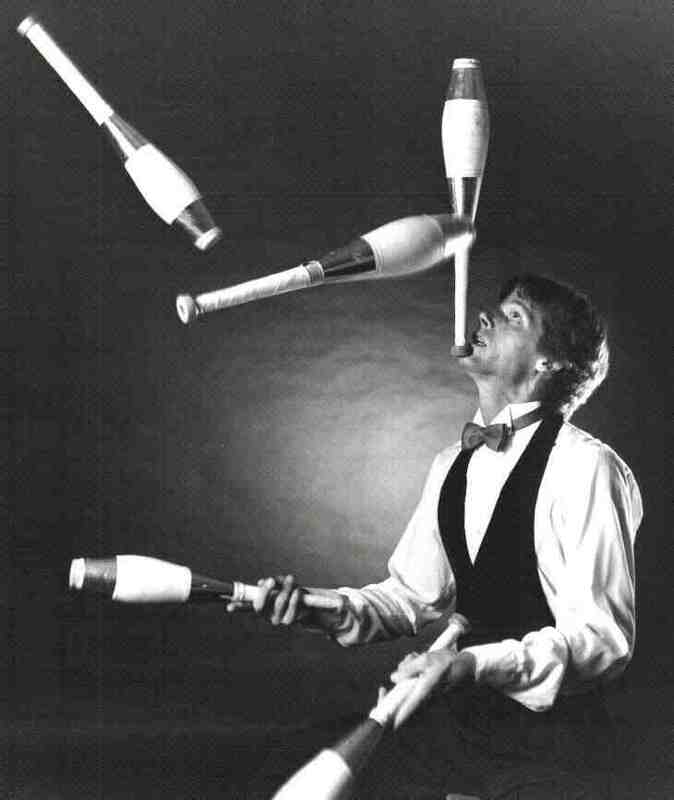 What hints and tips can you share about your juggling skills? You want to communicate in a way that motivates, convinces and inspires. Use our tips, tools and techniques every time you speak and, whether the audience is one person or a thousand, the basic principle will always apply. The three principles are clarity, confidence and commitment. Without being aware of it, women consistently undermine themselves in the workplace. Subtle behaviours sabotage their chances for the corporate success they seek and deserve. The actions listed below are those that female executives probably would not be aware of if they weren’t pointed out. Simple changes in behaviour can make the difference between being perceived as powerful and in control and merely being part of the pack. 1. Women do not fill their physical space. Powerful people take up more space than those who question their ability. It is not a matter of size; rather, it has to do with the way women hold themselves. 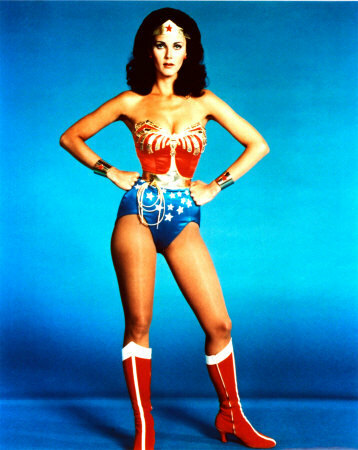 Visualise Superman or Wonder Women: They stand with their hands on their hips and their legs apart. Solution: Stand in the “Power Position” the strongest pose you can use. Place your hands facing each other and steeple your fingers, so that your fingertips are just touching. This forces your palms apart and whether you are sitting or standing your arms will take up more space. 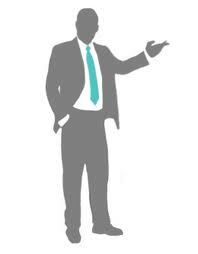 This is a highly effective negotiating posture; watch CEOs, politicians and solicitors to see how they use the gesture. 2. Women introduce themselves too soon. For the first 7 seconds of meeting a person, no one pays attention to what is being said. The visual message is the first to be received and is absorbed before the aural. That helps explain why we often forget the names of people we’ve just met. We were too busy taking in visual signals to pay attention to the words being spoken. Solution: When you first meet a person, engage them in conversation before giving your name. Talk about what you do, who you work for and any other topic of interest before saying who you are. By then the person to whom you are speaking will have a reason to remember your name. 3. Women nod when listening. Men nod their heads to demonstrate agreement. Women perform the same action to show that they are listening. It is a sign of empathy and connectedness, rather than agreement. Men often mistake this action, assuming that a woman is agreeing with what is being said, when what she is actually doing is just paying attention to what he is saying. Solution: Be aware of your behaviour. If you disagree with what is being said, be sure to say so verbally. This will avoid misunderstanding. 4. Women tilt their heads when conversing. Note how women tend to tilt their heads when they speak. A tilted head indicates that the person is committed to what is being discussed. It demonstrates an active listening style and is a sign of an empathetic communicator. This position deters from the strength of the communication and is a weak position from which to speak. Solution: Again, be aware of your behaviour. Keep your head upright, evenly balanced on your neck. Relax your shoulders, keeping your upper chest softly opened like a book. This position will give you a look of authority and influence. 5. Women’s voices go up at the ends of sentences. Because women’s natural instinct is to please, their voices tend to rise at the end of their sentences, giving the sense of asking a question or seeking approval rather than making a statement. This explains why a woman’s suggestions may be given short shrift during business meetings. Solution: Consciously listen to your voice and work to develop your lower register. Practice using a tape recorder. A lower voice has more credibility, which is why 80 percent of commercial voice-overs are performed by men. If you hear your voice going up at the ends of your sentences, repeat them, forcing the intonation to go down. 6. Women fidget. According to behavioural studies, when men enter a conference room they make 12 major movements. 27 is the average for women. While many of these involve getting settled in their seat, women will also make adjustments to their clothes, hair and jewellery. Random, excessive movements indicate nervousness and will detract from your sense of authority. You will be perceived as being weak and nervous. Solution: Awareness, as always, is key. Keep your movements purposeful and to a minimum. 7. Women allow men to finish their sentences for them. While no woman would want to acknowledge this, it is quite common for women to fade out at the end of a sentence, allowing men to pick up on what they were saying and finish the thought. Women will also allow themselves to be interrupted, while rarely interrupting another speaker. Over time, these behaviours will lead to low self-esteem as others take advantage of the opportunity she has created for them to be heard. Solution: If co-workers insist on interrupting you, increase the volume of your voice and keep speaking. If they continue to speak over you, put up one finger to indicate that you have not yet finished. If that doesn’t produce the desired result, hold up your hand as if to say, “Stop!” Or, you might say, “Excuse me, I hadn’t finished.” Assertiveness shows that you are confident and aware of your rights. While it sounds simple, it may be difficult to do at first. 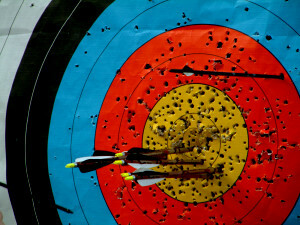 The more you practice, however, the easier it will get. And add to that, you’ll feel good about yourself, too! Gestures are a part of our daily communication. They are a means of demonstrating our attitude about a subject. They can reinforce our message or contradict what we’re saying, giving an insight into our REAL feelings. According to psychologists, using gestures while speaking improves the brain function of the speaker, making them more effective communicators. Open and closed statements can be demonstrated visually by the way we gesture. When we speak with our palms facing upwards we are being open and inviting. The open palm gesture is effective for introducing oneself and inviting a response from your listener. When our palms are facing downwards they indicate a strong, definitive statement, one which is not open for debate. Dr Susan Goldin-Meadow of the University of Chicago. Professor of psychology. argues that gesturing “helps mental coherence and increases the efficiency of speech.” Research has concluded that gesturing helps to stimulate our memories as well as reinforcing the message. What do your gestures say about you?